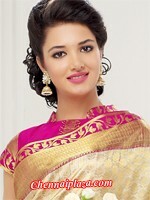 Lady's Fashion > Sarees > Bridal & Tradition. Silks -'16. Item Description Gorgeous looking multi colour soft silk brocade saree having beautiful leaves motif zari work decoration interpsersed all over cream colour body, complimented by pink and green combination in patli with leaf motif zari work decoration, zari work in pink colour pallu, with intricate creeper designer zari work in broad border. Item color Mango yellow cont. Item Description Lovely looking mango yellow/pink contrast colour soft silk brocade saree having self intricate diamond design decoration interpsersed all over mango colour body, complimented by pink colour patli decorated with leaf motif zari work decoration, intricate zari work in pink colour pallu, with rich zari work in broad border. Item Description Rich looking pink colour soft silk brocade saree having traditional motif design intricate zari work decoration interpsersed all over body, complimented by intricate geometric designer zari work in pink colour pallu, with rich zari work in broad border. Item color Leaf green cont. Item Description Fabulous looking leaf green/red contrast colour kanchi silk brocade saree having self intricate diamond designer zari work decoration interpsersed all over red colour body, complimented by green colour pretty patli pleats decorated with leaf motif zari work decoration, intricate geometric designer zari work in green colour pallu, with geometric zari work in broad border.